04.Feb.02 - On the 30th of January police violently attacked people from different groups who were camped at the gates of the detention center for immigrants in Malaga, Spain. They were taking action to denounce a previous episode of police brutality against a migrant demonstration in Almeria, Spain. They were also there in rejection of the Spanish government's policy of deportations of immigrants who organise and struggle to improve their conditions. Police attacked and injured many of the protesters and unlawfully arrested two of them: Nico and Kepa. Both were severely beaten after their arrests. Nico was taken into the detention center, were he was thrown to the ground and punched and kicked, by several policemen. A lawyer who was in the detention center, attending a group of immigrants, witnessed the attack as she was leaving the building. She attempted to intervene but was violently thrown out of the center by the police, although this seemed to detract the police from further violent actions. Once in the street she informed the journalists who had gathered outside, about what was happening inside the detention center. Minutes afterwards ambulances arrived to take Nico and Kepa to the hospital. The lawyer has also personally taken the police to court. Police reported that the detainees had committed public disorder and violently assaulted the police officers. This is categorically false, and is the standard procedure of the Spanish police when people denounce having been beaten. There is plenty of evidence to support Nico and Kepa. 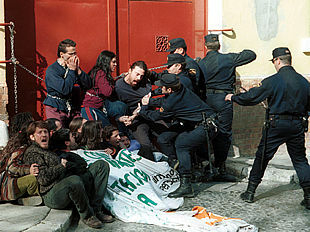 Images shown both on the television and in the newspapers demonstrate that at the moment of the arrest, both Nico and Kepa were sitting on the ground linking arms with fellow protesters in a peaceful way. Their only crime was to have practiced non-violent civil disobedience against the draconian Spanish immigration laws. Currently they are on police bail with various charges relating to the police accusations. In a new turn of events, on the 1st of February, Nico was notified by the Immigration Office that his deportation was in process in relation to the charges of public disorder. The DEPORTATION order will be activated on the on Saturday 9th of February, although the appeal process sets the FINAL DEADLINE on the 15th of February. The country of his deportation would be Italy, as Nico has a dual Italian/Argentinean nationality. Nico is a permanent resident of Malaga, where he has been studying for several years. He has full legal rights to live anywhere in the European Union, however the Spanish government is using a legal loophole that gives full power to the local Government Representative to deport foreigners without charges being proven in court. There is a very small chance for a judicial review, but after that the Spanish judicial system is kept completely out of the case and the regular legal basis of the presumption of innocence and a fair hearing do not apply. The deportation order comes directly from delegate of the Spanish government for the province of Malaga: Mr. Carlos Rubio. It is also entirely in his hands to take a more reasonable position, and behave in an less authoritarian manner, by canceling the deportation order. There has been a massive social and media response to this case in Andalucia and the rest of the Spanish State. Civil organisations, NGO's, trade unions and the parliamentary party Izquierda Unida, have expressed their dismay at the police actions. They have also asked for the resignation of Mr. Carlos Rubio, and the government delegate for Almeria in relation to the previous police brutality on immigrants in that province. This event is part of a wider trend of criminalisation and repression of social movements throughout Spain, which has become particularly acute as the mass mobilisations related to the Spanish presidency of the European Union get closer. This is setting a grave precedent of violation of the freedom of movement within the European Union, and points at what can be expected during the forthcoming EU meetings next summer. Your support and solidarity can help stop this injustice. We ask you to send faxes to the government delegate Mr. Carlos Rubio, demanding the deportation of Nicolas Sguiglia to be cancelled and an end to the repression of social movements. With the present writing we want to express our total support and solidarity with our mates, that since thursday 24th jamuary have been doing an unlimited camp in front of the CIE (Detention Center) against the detention of a group of inmigrants in Almeria, when they were demostrating peacefully for the right to live with dignity.Also we want to manifest our rejection to the disproportonate and brutal police behaviour, that once the camp was dismantle and when the demostrators were leaving, the police charged against them incomprehensibly, as a result they imprisoned two people but previously they were hardly beaten up inside the CIE.
As is it wasn't enough, one of the imprisoned and beaten up people, Nicol�s Sguiglia, having double nationality argentino-italian, has received this friday 1st of february, an expulsion order, that can be executed in 8 days, we found this measure unacceptable and that we will not tolerate it. As you should know being in the charge you repression against people who fight for better living conditions with dignity for everybody has never been a good solution, for that reason we demand your responsability for the events as well as the inmediate annulment of the expulsion order given to Nicol�s Sguiglia. NO AL EXPEDIENTE DE EXPULSI�N PARA NICOL�S SGUIGLIA!!! BASTA DE DEPORTACIONES!!! Mediante el presente escrito queremos hacerle llegar nuestro total apoyo y solidaridad con l@s compa�er@s que desde el jueves 24 de enero han protagonizado una acampada indefinida frente al CIE de M�laga contra la deportaci�n de un grupo de inmigrantes detenidos en Almer�a cuando realizaban una protesta pac�fica por el derecho a una vida m�s digna; as� como nuestra repulsa a la desproporcionada y brutal actuaci�n policial que, una vez desmantelada la acampada y cuando los manifestantes se dispon�an a abandonar el lugar de la protesta, cargaba inexplicablemente contra ell@s deteniendo a dos personas a las que luego propinaban sendas palizas puertas adentro del CIE.
Por si esto fuera poco, uno de los detenidos y apaleados, Nicol�s Sguiglia, de doble nacionalidad argentino-italiana, ha recibido este viernes 1 de febrero orden de expulsi�n a ejecutar en 8 d�as, lo que nos parece un hecho inaceptable que no estamos dispuestos a tolerar bajo ning˙n concepto. Como usted bien deber�a saber por el cargo que ocupa, la represi�n de las personas que luchan por condiciones de vida m�s dignas para tod@s nunca ha sido ni ser� una buena soluci�n, por lo que exigimos su responsabilidad al respecto de estos hechos as� como la anulaci�n o archivo inmediato de la orden de expulsi�n dictada contra Nicol�s Sguiglia.